When it comes to the content you post on social media, a main goal is to move customers closer to purchasing. For this reason, it is essential that you determine the types of content that resonate most with your audience. Below are six types of content that will help boost engagement, exposure and conversions. Interactive content gives your audience the opportunity to get involved with more than just likes and comments. Posting content that your audience can interact with has proven to be a big win. Consider Buzzfeed and their quizzes that are so popular. People love questions they can answer, polls they can take, contests they can enter, Q&A’s etc. So when you are trying to come up with your next post, this is the direction you should be going in. When posting content on social media, you want to give thought to how someone will feel when they read your post. It has been found that posts that bring out strong emotions are the ones that are most successful on social media. Positive and happy emotions (laughter, amusement, joy, awe) specifically make people want to share. A great quote or posts about achievements and struggles will definitely encourage people to share. UCG is considered any content about your company that is generated by your customers. This type of content is very good at boosting engagement on social media especially on platforms such as Instagram. 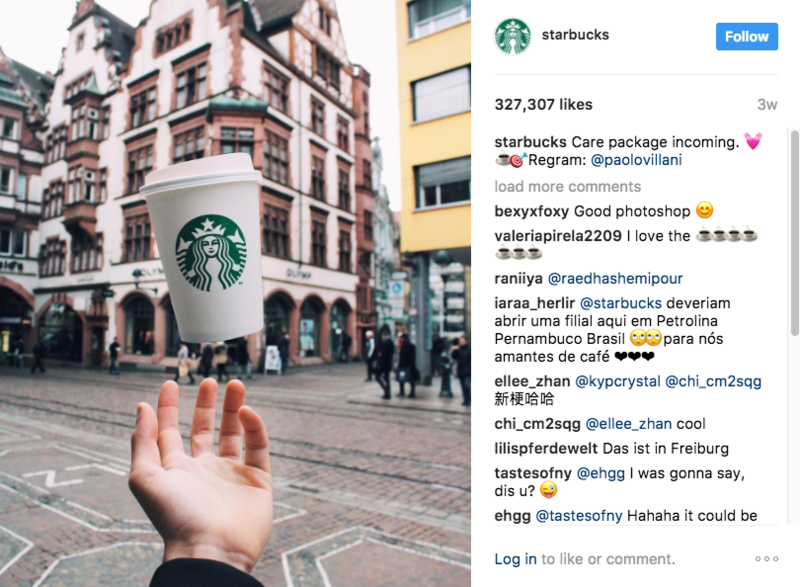 Here is an example of UCG with Starbucks regramming a fan’s photo on Instagram. When sharing UGC, make sure you are tagging the right people and that you are adding the right hashtags to increase exposure for your content. Video is much more liked by people over plain text and that is not going to change. In fact, if there is both video and text available on the same page, people will pick video over text to learn about a service or product. Video provides brands with a simple way to get their message across in 30 seconds while maximizing exposure. When thinking of content to use for your videos, take a look at any of your blog posts or other content that has seen some nice engagement. If you have some content that is already converting for you, it will typically perform well as a video. People are visual. They not only enjoy looking at visuals more but they also are able to better retain information contained in an image or video. There are a variety of ways to incorporate images into your content. There are charts, static images, video, gifs etc. Add in an image that is related to the headline. Find content that has performed well for you and look for snippets of information that can be turned into an image or video. Look through your content that is chock full of details. You can turn those details into an infographic. Another great way to help boost conversion rates is with running contests or giveaways. The key to making them successful is to make the prize worth entering for and that is attracts the leads you are looking to reach. You want the offer to be related to your business so giving away a camera might get a lot of entries, but it will not be helpful for your brand if you don’t sell them. Here is a great example from Siggi’s yogurt. Aside from your contest offer, you want to extend your reach and bring in more leads. To this end, you want to encourage your entrants to share your contest page so that you reach a larger audience. Make liking, sharing, retweeting and following your page a caveat to get an extra entry. You can also make them click through to a landing page in order to enter the contest. Creating and maintaining an effective presence on social media that will help boost conversions takes time. There are a number of ways to boost conversions for any business but you need to figure out what fits for your brand. Following some or all of the tips above will help get your content creation on track to boosting your conversion rates.